Lise Meitner (1878-1968) was a pioneer of nuclear physics and co-discoverer, with Otto Hahn and Fritz Strassmann, of nuclear fission. Braving the sexism of the scientific world, she joined the prestigious Kaiser Wilhelm Institute for Chemistry and became a prominent member of the international physics community. Of Jewish origin, Meitner fled Nazi Germany for Stockholm in 1938 and later moved to Cambridge, England. Her career was shattered when she fled Germany, and her scientific reputation was damaged when Hahn took full credit—and the 1944 Nobel Prize—for the work they had done together on nuclear fission. Ruth Sime's absorbing book is the definitive biography of Lise Meitner, the story of a brilliant woman whose extraordinary life illustrates not only the dramatic scientific progress but also the injustice and destruction that have marked the twentieth century. Ruth Lewin Sime is on the chemistry faculty at Sacramento City College. 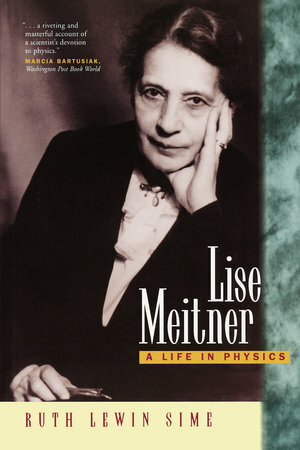 She co-wrote and narrated a BBC-TV program on Lise Meitner, A Gift From Heaven, which was named one of the best science programs of the year by The Royal Society in 1992.